Korea has come a long way since its first Winter Olympics, the 1948 games in St. Mortiz, when just three athletes represented the country. Since South Korea’s first ever podium finish in the 1992 Albertville Winter Games, the nation has won 26 gold medals, 17 silver and 10 bronze — a total of 53 medals. Korea has long had a passion for winter sports. Koreans have always taken to their snowy mountains and frozen lakes in winter in search of fun and relaxation. In old photos of the Hangang River in winter for instance, young couples glide across the ice on skates and beaming children push themselves across the frozen expanse on simple wooden sleds. Recent additions, including skiing and snowboarding, have only added to the country’s rich winter milieu. Now, as Korea hosts the 2018 PyeongChang Olympic and Paralympic Winter Games, the nation is poised to become an international winter sports destination. Sledding, or sseolmae, is one of the oldest winter pastimes in the nation. Kids would go to the nearest hill with an empty rice sack to use to slide down. Others used basins used for wintertime kimchi-making to race down the hill at top speed. Sledding is an opportunity for adults to revisit their childhood and share those memories with their children. For kids, it’s an experience they’ll treasure and pass to their kids. It’s this intergenerational bonding that makes sledding so special. Though the days of rice sacks and basins are long gone, and plastic sleds are now easily rented, Seoul now boasts some excellent sledding sites for all to enjoy. Seoulland (T. 02-509-6000): Located in Gwacheon, the popular amusement park also boasts two sledding courses — one for kids and one for big kids, i.e., adults. 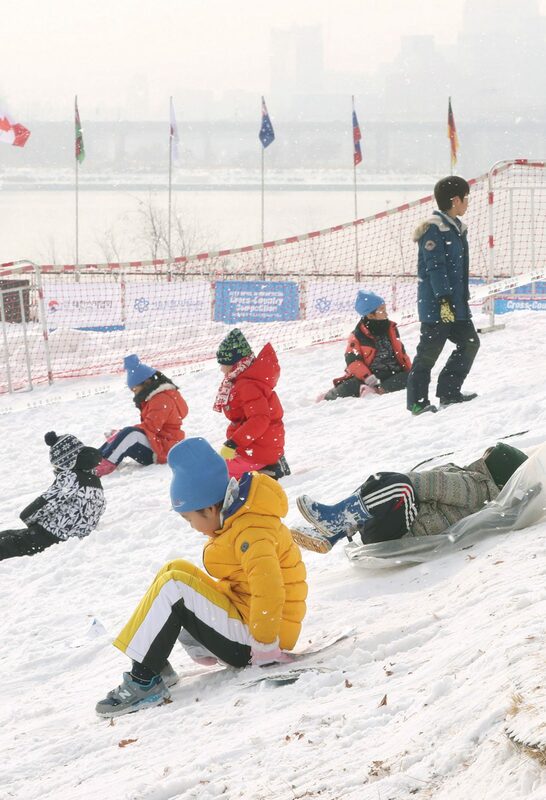 Ttukseom Hangang River Park (T. 02-444-5358): The temporary sledding hill next to the Hangang River is open until mid-February. Children’s Grand Park (T. 02-450-9311): The sledding slopes are open until mid February. Visitors to the park can also enjoy outdoor games, air bumper cars, inflatable houses and ice fishing. Koreans love to fish. In winter, old and young alike enjoy ice fishing on frozen lakes and rivers. Using a simple, light fishing rod with small, brightly colored lures or jigs, anglers sit at a hole in the ice, lifting the pole every now and then to make the bait look real. The most popular prey is trout, a beautiful fish that can be eaten either raw or cooked. 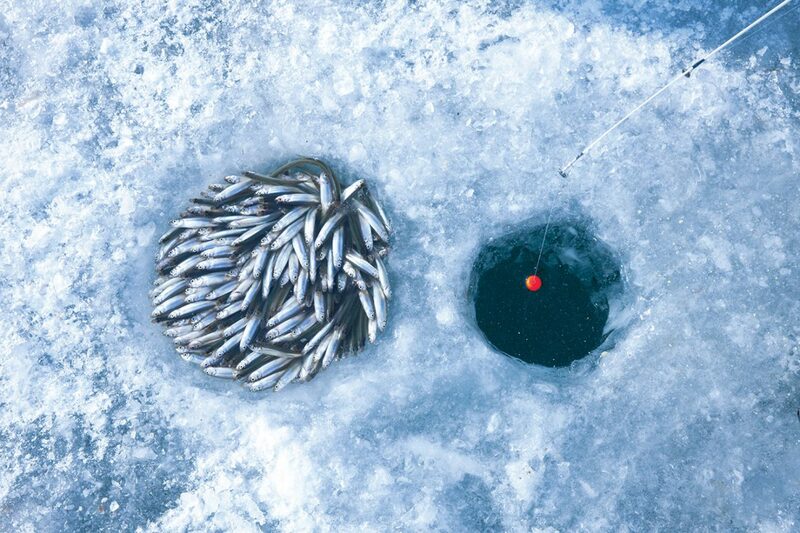 Korea’s popular ice fishing festivals let inexperienced ice anglers try their hand at this fun wintertime activity. One festival, the Hwacheon Sancheoneo Ice Festival in Hwacheon, Gangwon-do, regularly draws over a million visitors. So popular it is that the Lonely Planet named it to its list of the “Seven Wonders of Winter” in 2011. Hwacheon Sancheoneo Ice Festival (Jan. 6-Feb. 28): Hwacheon, a small town located in the rugged mountains of Gangwon-do, is one of the coldest places in Korea, but a hot destination for visitors looking to do a bit of ice fishing. The Hwacheon Sancheoneo Ice Festival is dedicated to the sancheoneo, a local variety of trout that thrives in the cold, clean waters. The festival includes trout ice fishing, lure fishing and bare-handed fishing (not for the faint of heart! ), with fishing zones for expats, children and infants, too. If you’re not a fan of fishing, the festival has other enjoyable programs such as snow sledding, ice sledding, ice soccer and even bobsleigh. Visit their website at www.narafestival.com (available in Korean, English, Japanese and Chinese). PyeongChang Trout Festival (thru Feb. 25): The PyeongChang Trout Festival perfectly compliments the 2018 PyeongChang Olympic Winter Games. Trout farming came to Korea in 1965 when 10,000 hatchery eggs from rainbow trout were brought to Pyeongchang from California. Trout is now one of Pyeongchang’s signature foods, both in its raw and breaded-and-fried forms. 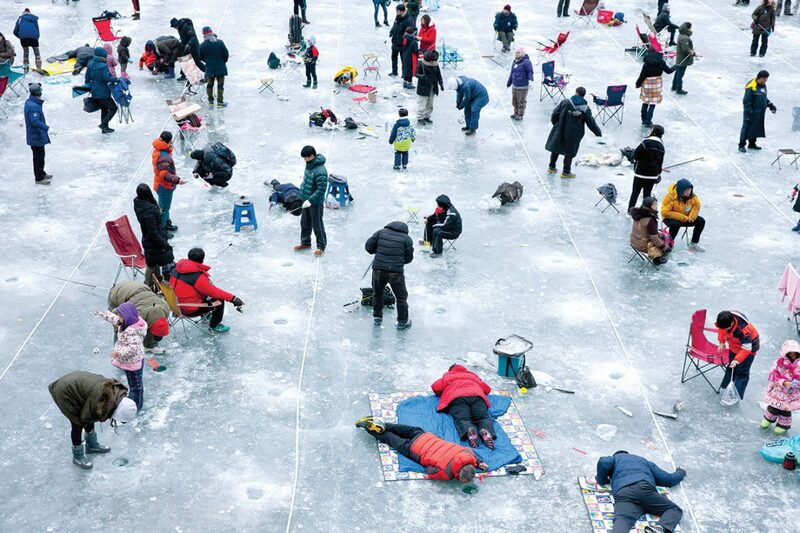 The PyeongChang Trout Festival offers plenty of ice fishing opportunities. There are non-fishing programs, too, including four-wheel ATVs, snow rafting and sleigh trains. Ice skating has been a popular winter activity in Korea long before Kim Yuna became a figure skating superstar. 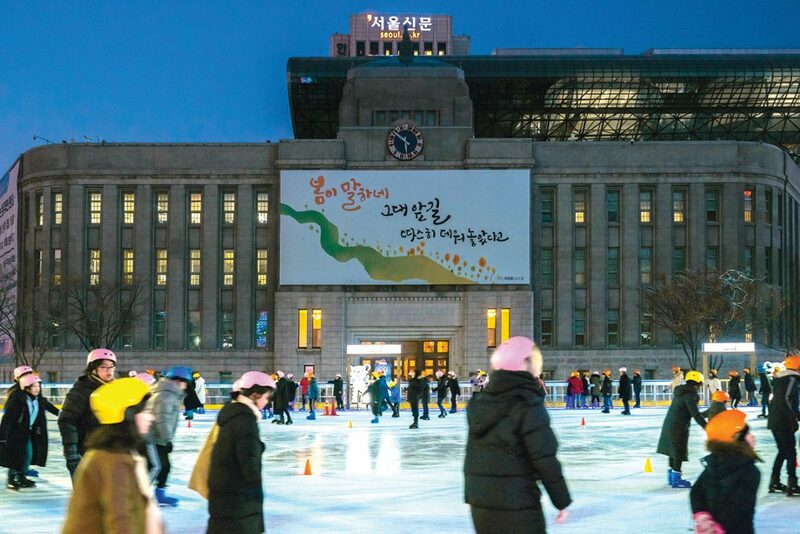 Ice skating came to Korea at the beginning of the 20th century. During the colonial era, Koreans and Japanese frequently held speed skating competitions. Three Korean speed skaters even took part in the 1936 Winter Olympic Games in Garmisch-Partenkirchen, Germany, albeit as part of the Japanese team. In the 1950s and 1960s, local police stations would turn sections of the Hangang River into impromtu skating rinks whenever the waterway froze — which it often did back then. Though few could afford skates in the old days, today’s affluence has made ice skating a leisure of the masses. Kids dreaming of becoming the next “Queen Yuna,” young couples on dates or anyone else with the time and inclination can head to one of Seoul’s several public ice skating rinks, lace on a pair of rental skates and hit the ice, all for a very reasonable price. SEOUL’s Exploring Seoul section has more information on Seoul’s ice rinks. 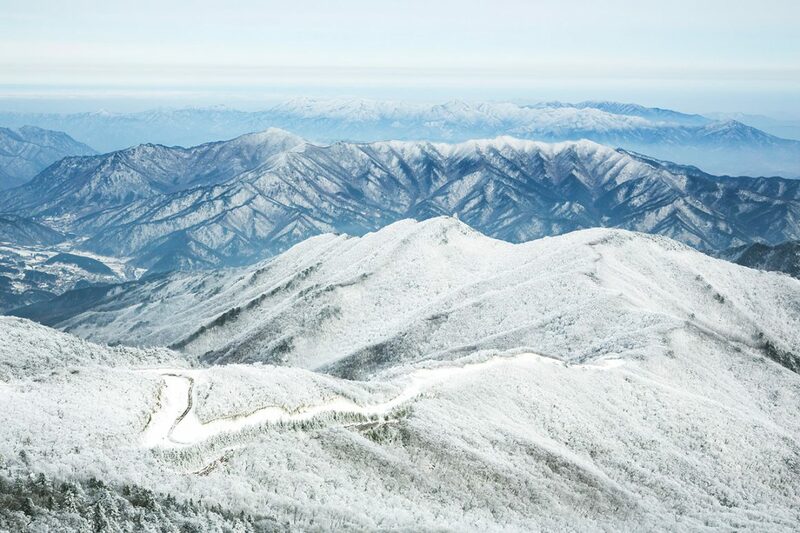 Living in a mountainous country, many Koreans head to the slopes during the winter season. The art of gliding on snow on underfoot strips of rigid material such as wood began in Northern Europe several millenia ago. In frosty mountain areas of Korea such as Pyeongchang, too, locals traditionally used wooden snow shoes, or soelpi, to get around when deep snow covered the ground. Korea’s first ski resort, Sinpung Ski Resort near what is now the North Korean port city of Wonsan, opened in 1926. The Joseon Ski Club — the forbearer of the Korea Ski Association — was founded in 1930. 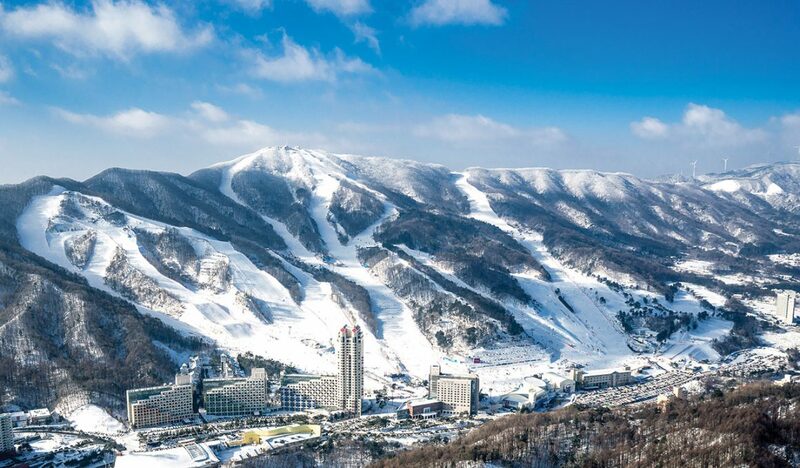 Korea now has a total of 21 ski resorts – 201 kilometers of slopes serviced by 137 ski lifts. Located in the heart of Korea’s mountainous spine, the highland province of Gangwon-do offers the best opportunities for snow sports since the rugged terrain yields the most snowfall in the nation. It’s here, in Korea’s “snow country,” that some of the best ski resorts are located, including those hosting many of the events of PyeongChang 2018. Where you go depends on your time, skill level and wallet. Most resorts have ski schools and instructors that speak English for non-Korean guests. 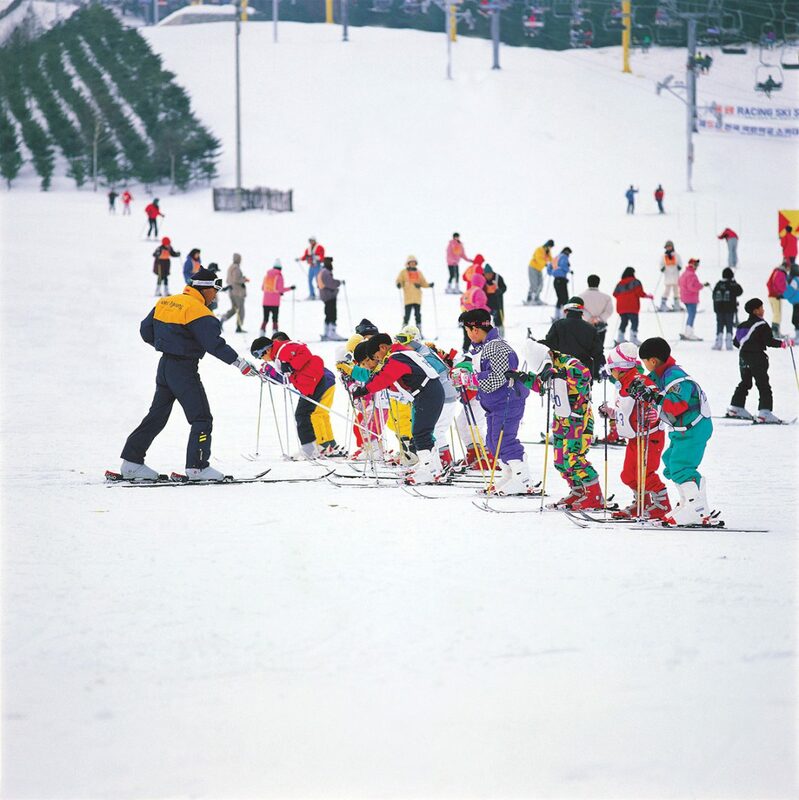 Pyeongchang’s Yongpyong Ski Resort, one of Korea’s most popular destinations, is the largest ski resort in the country. One of two resorts hosting events for PyeongChang 2018, Yongpyong expects an even bigger boost in the number of skiers and snowboarders. 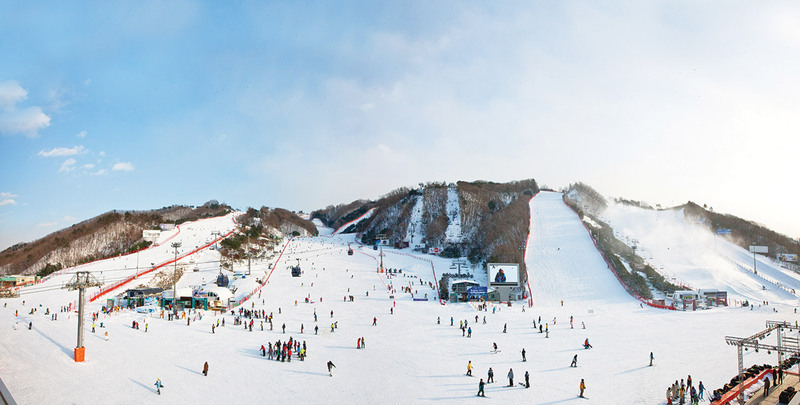 The High 1 Ski Resort, located on Taebaeksan Mountain in Jeongseong, is renown for its wide range of slopes. The slopes, carved out of rocky terrain, draw skiers and snowboarders of all levels. 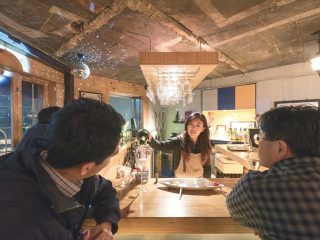 Located in Gyeonggi-do, the province that surrounds Seoul, Bears Town Ski Resort might not be as big as the ones mentioned above, but it’s still popular among skiers and snowboarders in Seoul as it’s less than an hour away. It has 11 lifts and a decent range of difficulty levels. While many look to rest in their rooms, or even hit the spas after, others look to hit the slopes again during the nighttime, when the snowy fields present a completely different feel and view. Almost all resorts offer nighttime skiing, and some resorts operate their lifts until the wee hours of the morning. Inspired by their winter sports legends, many young athletes train hard, dreaming of one day standing atop the Olympic podium like heroes such as Kim Yuna and Chun Lee-kyung. Others, however, do what they do just for the kicks. From diving into ice cold water to scaling frozen waterfalls, Korea offers adrenaline junkies and the merely insane plenty of reasons to leave the house in winter. Held for the 31st time in January, the annual Polar Bear Swimming Contest is one of the world’s craziest winter activities. 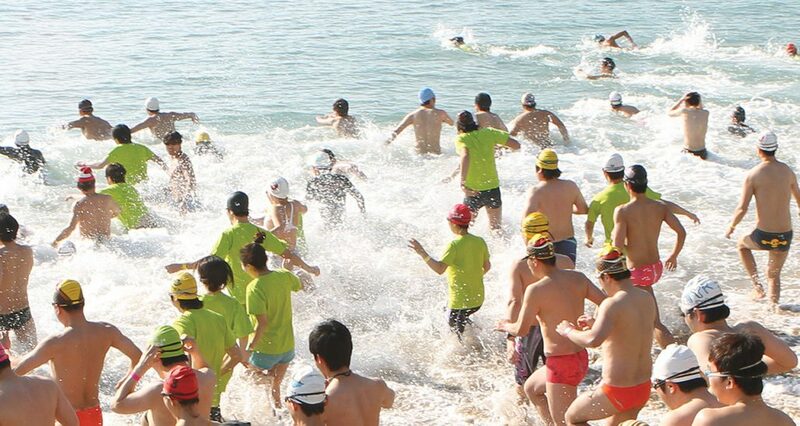 Participants from all over descend on Busan’s Haeundae Beach to jump into the frigid sea wearing nothing but swimsuits. Believing that diving into the cold water will make you stronger during the winter season, more than 2,000 people swim in the icy waters, braving the cold. The BBC was so impressed — or horrified — that it included the event in its list of the top 10 unusual winter sports in 2010. Perhaps thanks to Kim Ja-in, the world class climber who has not only won a number of gold medals in World Cup events but has also climbed the tallest building in Korea, Koreans are growing to accept climbing as an exciting sport and a fun-filled activity. Some climbers are even taking their sport to another level through the challenge of ice climbing. With heavy emphasis on safety, ice climbers get together to climb icy mountains and cliffs. 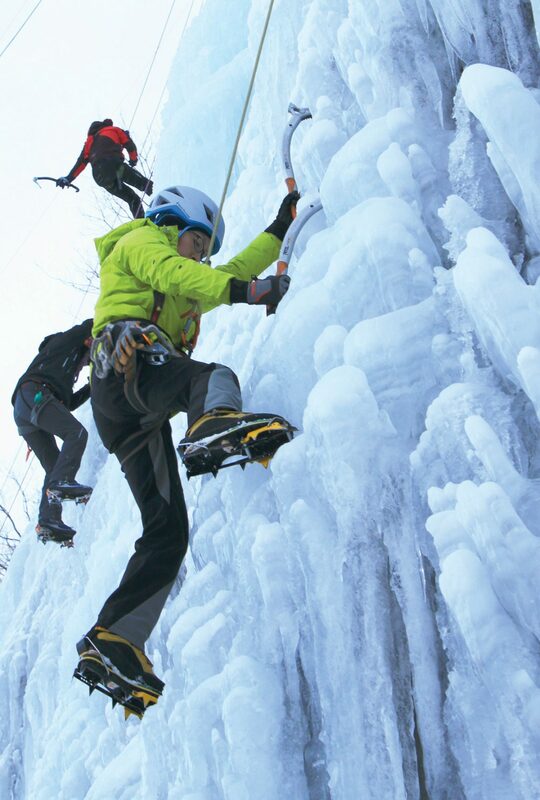 Frozen waterfalls such as the one in Cheongsong’s Eoreumgol Valley, the site of the 2018 UIAA Ice Climbing World Cup (Feb. 9–11), and Seoraksan Mountain’s Towangseong Waterfall are especially popular challenges, so much so that some cities and towns have created their own artificial waterfalls for ice climbing. If the great outdoors aren’t your thing, try the indoor ice wall at Kolon Alpine School in Ui-dong, Seoul. The four-story wall of ice is the world’s tallest at 20 meters. With instructors present, it’s a good place to learn the ropes, both figuratively and literally. Sanirang Alpine Networks LLC (sanirang.net) offers classes on ice climbing, too, taught by English speakers. Danyang-gun, Chungcheongbuk-do is known for its majestic paragliding. Most choose to go paragliding in the summer or fall, but some hearty souls take on the challenge of paragliding in winter. It might be cold and windy, but the views of the frozen landscape won’t be soon forgotten. Koreans love to play golf. So much so that some even play “snow golf” in the winter time. Hitting off smooth, white fairways, golf enthusiasts have found a way to pursue their passion even amid the ice and snow. Some country clubs let golfers hit the links in the snow. While the scenery might change, the goal of the game remains the same, as do the rules. Pro tip — keep your garden-variety white golf balls in your bag and use colored ones instead. You should also avoid using clubs with graphite shafts as they can shatter in very cold weather. Asia’s next winter sport’s hub? National and local authorities hope the 2018 PyeongChang Games can turn Korea generally and the province of Gangwon-do specifically into one of Asia’s major winter sports destinations. “The hope is that the Olympics can have a lasting impact on the tourism industry here and help South Korea rival Japan — and upstart China — as a winter sports destination,” wrote the New York Times in a February 2017 story on Pyeongchang. Where Korea becomes a major Asian winter sports destination remains to be seen, of course. The country’s mountains are not as high as those in Japan, nor does it get as much snow. Its sky trails are still a bit too easy for more experienced skiers, too. The difference can be seen in the numbers. According to statistics from the Ski Business Association of Korea cited in the New York Times, ski visits to Korea peaked at 6.8 million in 2011–12, while Japan still averages 30 million ski visits per year. Still, by placing the Korean winter sports scene squarely in world view, the Olympics might help make the country a winter destination.